The Melon Kingdom is the eleventh kingdom in Donkey Kong Jungle Beat. In the original version of the game, it is the third kingdom linked to the J Barrel and can be accessed by completing all the kingdoms linked to the K Barrel and collecting sixteen or more Crests. In the New Play Control! version, it is the second kingdom linked to the B Barrel and is accessed by completing the Peach Kingdom. It is the dominion of Bloat-Hog in the Nintendo GameCube version of the game, or the dominion of Torch Tusk in the New Play Control! version. At the end of every level in the kingdom, Donkey Kong eats a giant melon. Iguanagon's Realm is the first area of the Melon Kingdom. It takes place mostly in an icy, flat cavern. This is the second level after Silver Snow Peak to be traversed entirely while riding on Hoofer, and it features some areas that require a high speed to be jumped to. Blood Pines litter the ground and are used to defeat the enemies in this level, including the giant amphibian-like foe, Iguanagon, who makes his second appearance here. It takes ten hits to defeat, and doing so awards Donkey Kong with 100 beats. 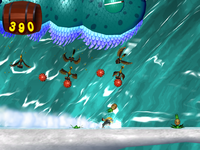 Like most ice-themed levels, Donkey Kong does not need to bite into the giant fruit at the end of the level to move on, and can instead simply touch it to finish the level. When the fruit is touched, Hoofer takes Donkey Kong to a bonus game. Banshee Swamp is the second area of the Melon Kingdom. It takes place in a haunted swamp with many spirits floating by in the background. There are many pits in the level that are filled with a ghostly, blue substance that can easily damage Donkey Kong if touched. Blue wisps are also located around many parts of the stage, and they move all throughout the areas, trying to hit the ape. 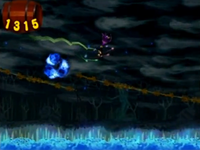 Helper Monkeys can be put to use in Banshee Swamp, as well as the two Jungle Buddies, Flurl and Helibird. Both Flurl and the Helibird help him progress over pits and up through the stage. A Mini Slump Bird must be defeated to complete the level. 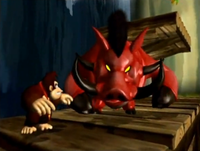 In the Gamecube version, Donkey Kong then encounters Bloat-Hog. Bloat Hog looks like the other Hogs, but with red skin and a black Mohawk, and is fought on a cliff side and bridge near a waterfall. He fights by using the other Hogs attacks. When it is half defeated, Bloat-Hog gains the ability to mentally create and fire bursts of electricity. When he is defeated, Bloat-Hog will fall over, unconscious. In the New Play Control! version, Torch Tusk is faced. Torch Tusk looks like the average Tusk boss, including the brown coloration. He is faced in a volcano-like setting, and attacks by using the attacks the other Tusks used earlier. He can be attacked by throwing pineapples into his trunk, causing its heart to come out. DK can then throw four more pineapples into its heart, causing more damage. When Torch Tusk reaches half his health, he gains the ability to attack by firing flaming cannonballs. After being defeated, Torch Tusk will somewhat fall apart and deactivate.